All blades are made of German high-carbon stainless steel and perfectly keep an ultra-sharp edge during the mandoline service life saving you the trouble of resharpening. The peeler is somewhat of poor quality. Being a globally renowned manufacturer of kitchen hand tools for decades, Borner always offers only high-quality products. And this food mandoline is not an exception. 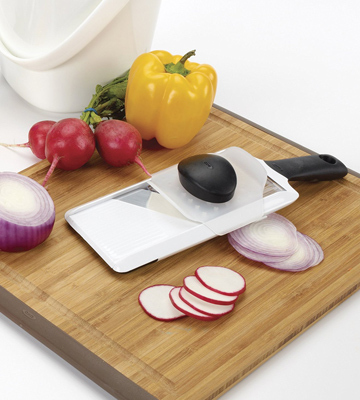 The slicer boasts a well-thought design ensuring consistent cutting performance along with the ease and safety of use. 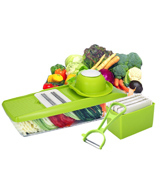 6 inserts included in the set will let you cut vegs and fruit into sticks, cubes, and slices of different sizes or even grate them ensuring a whole variety of cooking options. A storage box is a bit small for accommodating all inserts. With this premium mandoline set from Chef's Inspirations, you'll get everything you need to create delicious and flavourful dishes that will not only taste good but also have an aesthetic and appetizing look. As the product name suggests, you'll get the inspiration for cooking. A cutting blade is made of specific corrosion-resistant stainless steel allowing you to safely clean the slicer in a dishwasher rest assured that it won't rust and will perfectly keep the sharp edge. The handle is not ling enough. 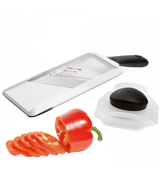 Fitted with integrated blades, the Oxo Good Grips mandoline slicer will let you obtain ideal slices of the desired thickness by simply switching a built-in controller that will save your time and efforts on changing the blade inserts. 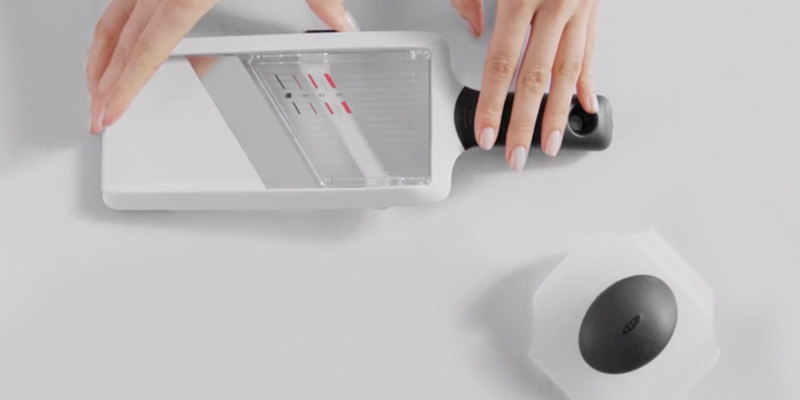 Enjoy quick, easy, and consistently efficient cutting with OXO. 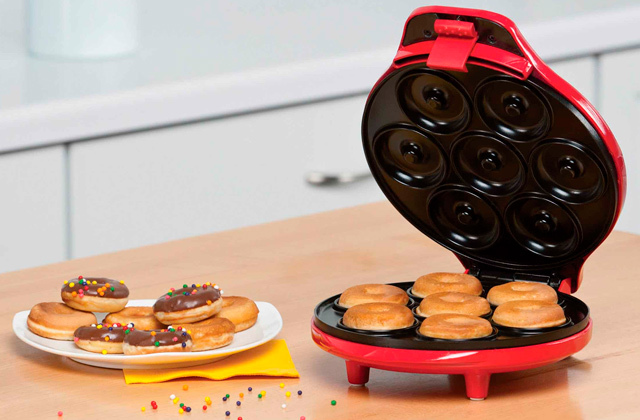 In addition to a variety of accessories, this model comes complete with a food container to cut foods into. 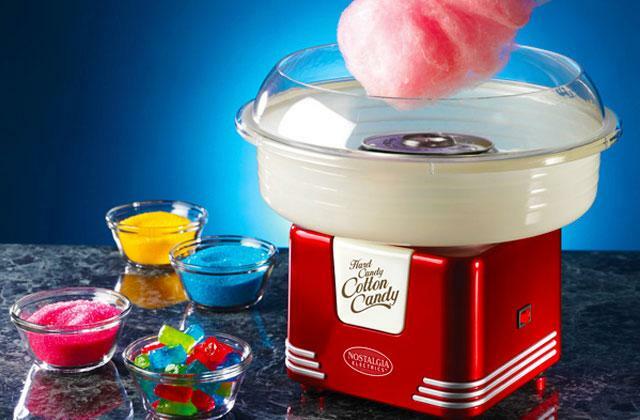 It's made of transparent food-grade plastic allowing you to control the filling level. Blade inserts are a bit inconvenient to change. Food cutting, slicing, shredding, and grating often appear to be pretty messy tasks with food shavings and shreds spread all over the countertop. Forget it! 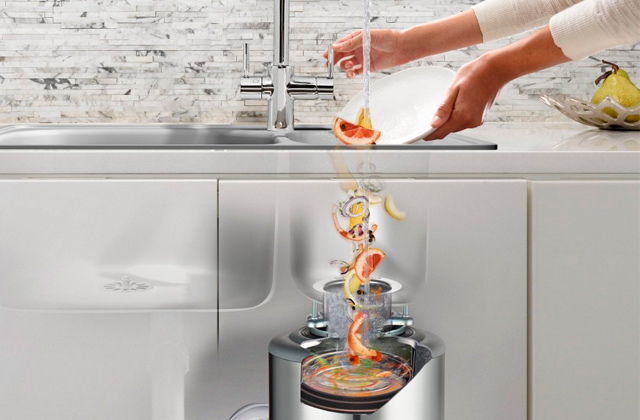 With the Baban Multi-Function Food Slicer, you'll be able to quickly accomplish a variety of cutting tasks and keep your countertop perfectly clean. 2 built-in julienne blades will give you an opportunity to get finely cut sticks of two sizes without the need to change the blades. Meanwhile, a special blade cover will securely protect you from cuts. Adjustment knobs are rather slippery when switched by wet hands. If you are into healthy eating and your daily menu always includes fresh fruit and vegetable salads and mixes, this simple yet practical food mandoline will be of great use to you. Allowing you to make several portions of salad in mere minutes, the slicer will significantly cut the time you spend on chopping ingredients every day. Since 1956, Borner has been producing premium-class manual juicers, peelers, slicers, and graters at its factory in Germany. For almost 70 years, the company has been focused on manufacturing products to the highest standards and introducing innovations to reach the highest level of performance and durability. All Borner products stand out for the highest quality and are created to make your kitchen experience as enjoyable as possible. The Borner V5 PowerLine Plus mandoline is not an exception. 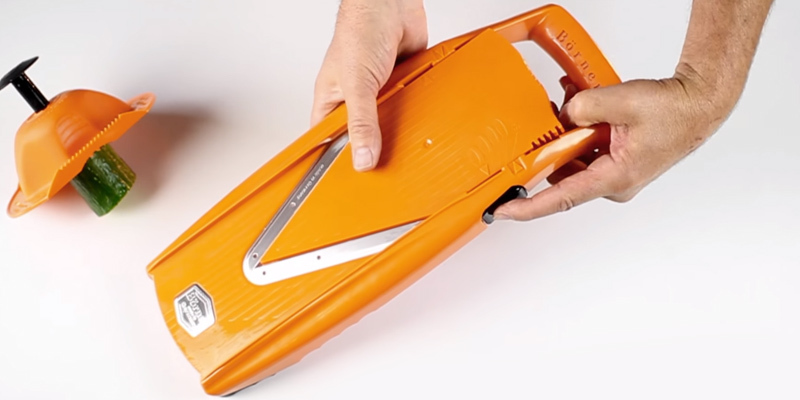 Being an updated version of the original Borner V-slicer, this model offers the same patented V-shaped blades ensuring extremely precise, close, efficient, and, what’s not less important, quick cutting. Made of high carbon stainless steel and featuring a micro-ground cutting edge, blades not only boast surgical sharpness but also will remain razor-sharp for years delivering consistently flawless cutting performance. Meanwhile, 3 adjustable inserts coming in the set provide a wide range of cutting options. Thus, you can get slices in 4 different thicknesses, julienne sticks in 2 sizes, and cubes, either finely minced or diced. Besides, as a little pleasant bonus, the package includes an original Borner Combi Peeler that will let you both peel and garnish all kinds of fruit and veggies. As other Borner products, the V5 PowerLine mandoline is created with every user safety and convenience in mind. Non-skid feet and an ergonomic handle will ensure stability during cutting while a blade release button will help you quickly change between the inserts. A food safety holder will securely fix the food item to be cut and protect your hands and fingers from accidental injuries. The inserts caddy will safely accommodate all attachments and perfectly fits onto the mandoline base for compact tool storage. The mark “Made in Germany” always stood for the highest quality and the Borner V5 PowerLine mandoline fully proves it. 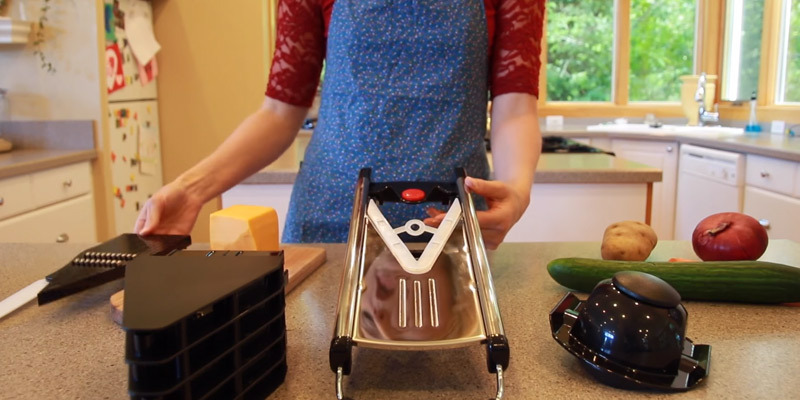 This food slicer will definitely become one of your best kitchen assistants. A scrumptious carpaccio salad of finely sliced fruit and vegs, crispy potato chips with shrimps and garlic sauce, or a gorgeous tart with paper-thin apple and pear slivers and creamy topping. All these are the dishes from the restaurant menu that usually have a tantalizing look evoking your appetite. How often after a dinner in the restaurant did you try to make those picture-perfect dishes at home and failed? Even if you managed to get similar taste and flavour, you often can’t achieve the same appetizing look. And in most cases, it’s not about a recipe or cooking technique but rather about ingredients preparation since you can’t get the same professional cuts as in the restaurant. 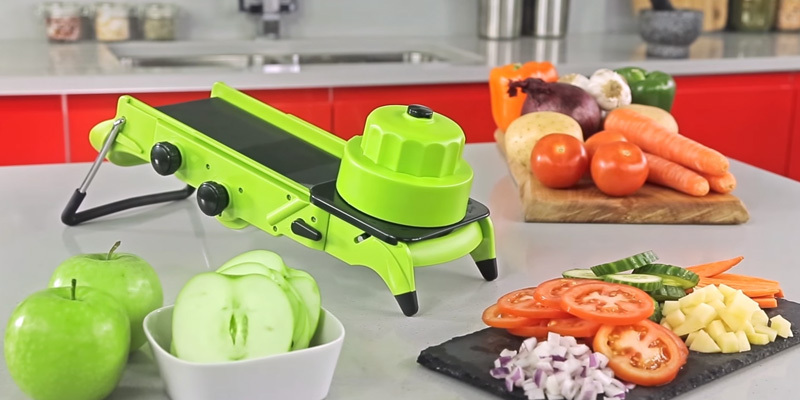 At least you couldn’t until now when you have an opportunity to add the Chef’s Inspiration all-in-one food slicer. The first thing you will like about this mandoline cooking utensil is its ergonomic and reliable design. Made of premium food-grade stainless steel and high-quality BPA-free plastic, this kitchen cutter is extremely durable and can easily withstand extensive daily use. Cutting blades are razor sharp and will deliver consistently efficient performance year after year. Supportive adjustable non-skid stands and a non-slip handle will provide stability and comfort during use while a handy food holder will ensure safe and precision cutting. After use, you can simply rinse the slicer under warm running water using a special small brush included in the set or wash it in a dishwasher. Yet, what will strike you most is the mandoline functionality and amazing cooking results it allows to achieve. 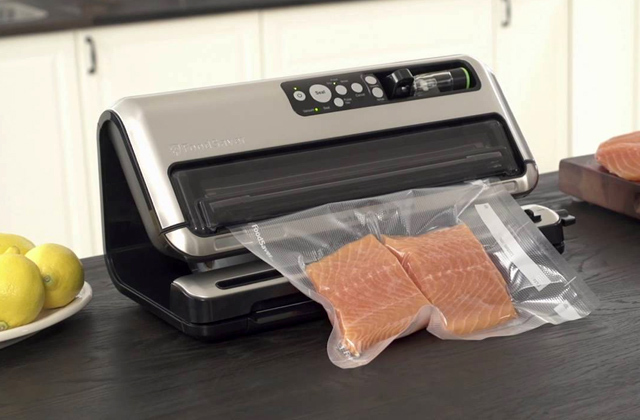 The package includes 6 different inserts that will let you cut the ingredients into perfectly uniform slices, sticks, and cubes of different thickness as well as grate foods into fine shreds. Thus your salads, gratins, quiches, ratatouilles, stir-fries, veg lasagne, pies, and multi-layered desserts will not only taste delicious but also look appealing and appetizing. With the Chef’s Inspiration food mandoline, you can get professional cooking results at home and will be always inspired to cook. Today, we can find a whole range of various kitchen appliances and hand tools specifically created and carefully designed to take the strain and hassle off out of the cooking process, slash the time we spend in the kitchen, and make our cooking experience more enjoyable. However, when you have a number of undoubtedly useful and helpful tools and utensils, you might face the problem of limited storage space, especially if your kitchen size is far from large. 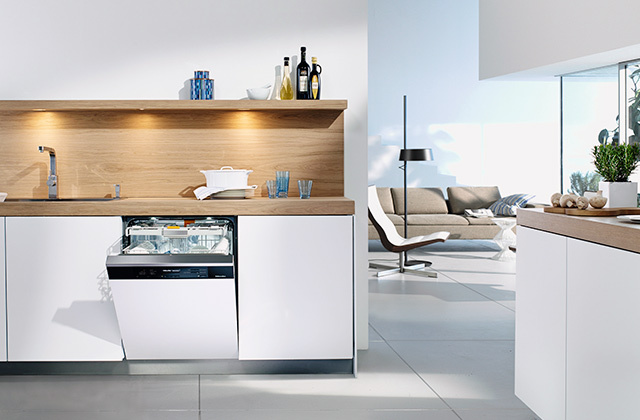 Thus, those who leave in dorms, studios, small city apartments, or simply have confined kitchens, usually select feature-packed compact appliances and hand tools ensuring the necessary functionality and taking minimum storage space. When it comes to mandoline slicers that make an efficient alternative to knives and became almost a must-have utensil in any kitchen, most models are rather big and come fitted with numerous inserts or attachments requiring pretty large storage space. This is where the OXO Good Grips mandoline slicer will come in handy. 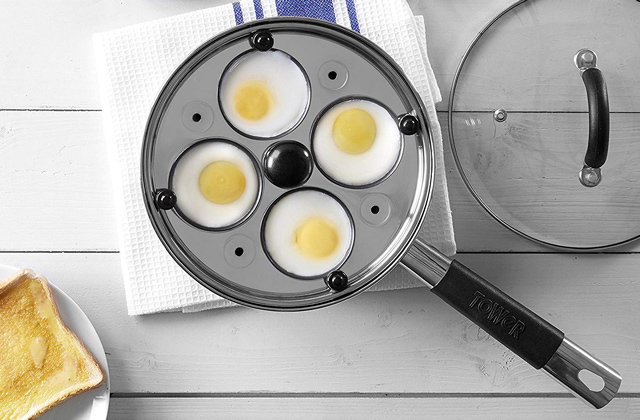 Owing to its handheld design, this food cutter is compact and will perfectly fit into any kitchen drawer. And the tool is really simple that will let you quickly get the hang of it. Actually, it’s a plastic mandoline base with a single stainless steel cutting blade and a handle. Yet, despite its overall simplicity, this model offers all essential features you’d expect from a good food slicer. See for yourself. A durable plastic base and a solid razor sharp blade are designed for extensive daily use within a long period of time. The cutting blade is made of specific corrosion-resistant stainless steel allowing you to safely clean the slicer in a dishwasher and rest assured that it won't rust and will perfectly keep the sharp edge. The handle is ergonomic and features a non-slip coating to provide a firm and secure grip. Along with a non-slip rubber rim on the base, it will ensure stability and precision while cutting. The set also includes a handy food holder to fix the food item in place while you slice and to keep your hands away from the blade. Though the tool is meant only for slicing, it allows you to switch between 3 slicing thicknesses by adjusting the blade position with a knob. The OXO handheld slicer will let you rip all the benefits of mandoline cutting without sacrificing much storage space in your small kitchen. 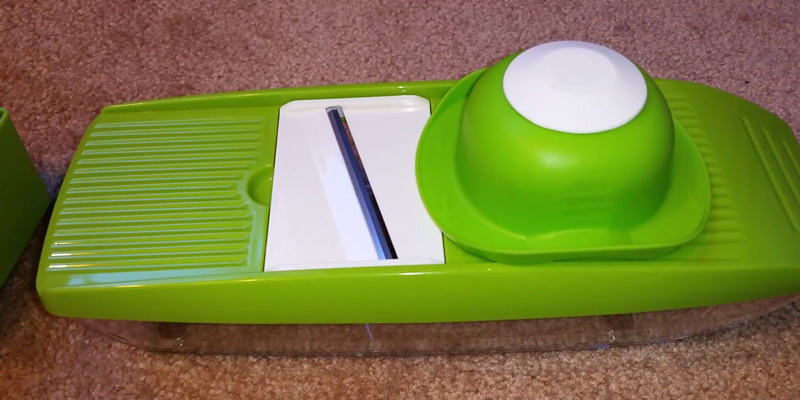 What makes an efficient and functional mandoline slicer? Commonly, it’s a reliable design that will determine the tool longevity, a number of cut types the slicer can deliver that will ensure a variety of cooking options, and usability features that will provide comfort, convenience, and ease of use. 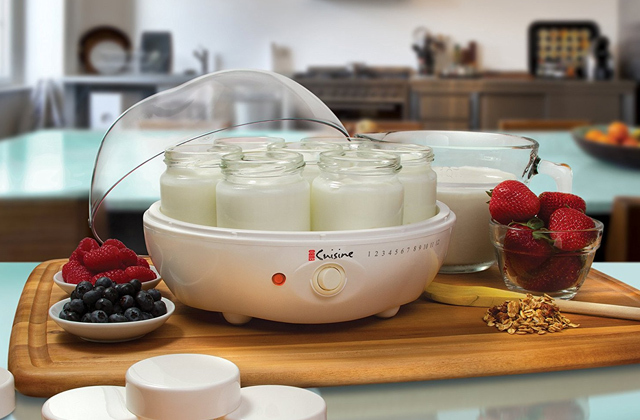 This is exactly what you will get with the Baban Multi-Function Food Slicer. Unlike the majority of mandolines allowing you to slice directly into a bowl, onto a plate or a cutting board, this model features a bit different design definitely created with every user convenience in mind. Following the same operating principle as many other mandoline slicers pressing food into uniform cuts, the Baban also has a flat cutting base with a blade insert. 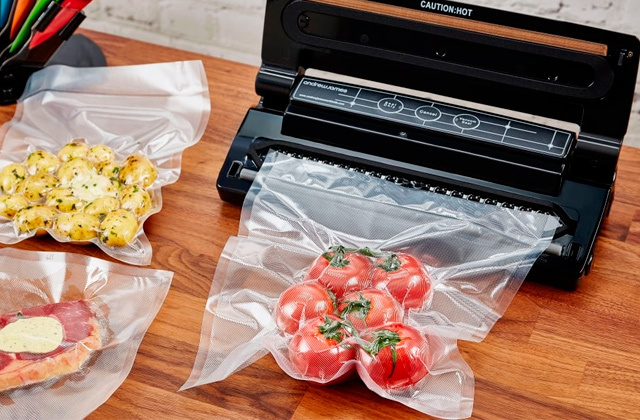 Yet, instead of a handle and stand or feet, it comes fitted with a transparent plastic food container that collects all cuts and doubles as a slicer stand preventing it from flipping or slipping during use. Similarly to other mandolines, the Baban slicer also has a protective food holder for safe and convenient cutting. Complete with 5 interchangeable blade inserts, this cutting tool will let you choose the desired cutting type and thickness and help you cut all types of foods. 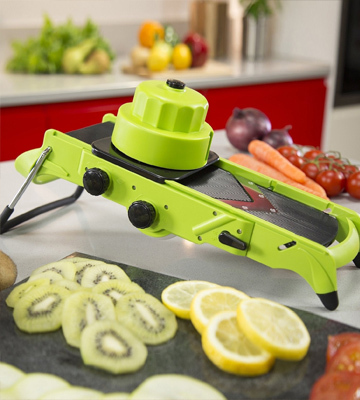 The straight fine slicer is ideal for cucumbers, zucchinis, and lemons while the 2.5mm blade will perfectly cope with potatoes, beetroot, carrot, and apples. The julienne blades will both cut hard veggies to nicely thin long strips for a variety of your healthy and tasty salads, soups, stews and stir-fries and work great for cutting garlic, ginger, nutmeg, or even chocolate for a variety of spicy dishes and flavorful desserts. Meanwhile, with the grate insert, you can create lovely crinkle cuts to get wavy carrot, potato, or apple chips. After use, you can remove the food remnants with a special brush, wash the mandoline in a warm soapy water and neatly store all accessories in the plastic food container. Whether you are an experienced cook or a culinary enthusiast, this food mandoline will add speed and convenience to all your cutting tasks. Looking for a quick and easy way to make virtually transparent lemon slices for your lemon tart, cut potatoes into uniform shreds for crispy homemade French Fries or crafting perfectly uniform apple cubes for a sweet marmalade? 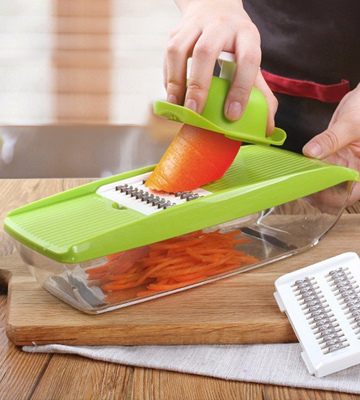 The mandoline slicer from Tower smartly combines a simple design with the functional versatility to offer you the ultimate way to slice and dice fresh fruit and vegetables. While many other mandolines come packed with a variety of blade attachments, the Tower slicer has no interchangeable inserts and features only integrated blades. However, the tool functionality is in no way inferior to premium models. 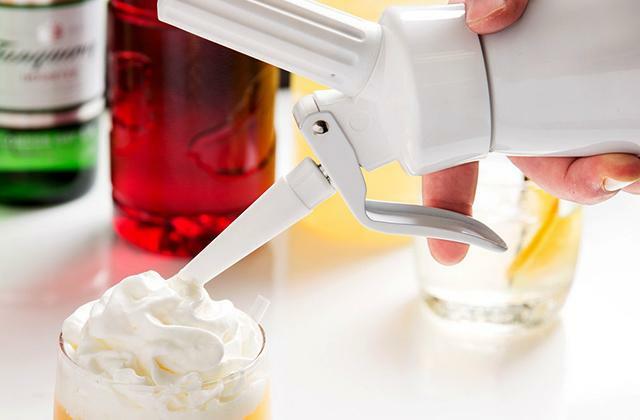 Amazingly easy-to-use, it features an adjustable slicing blade that allows you to choose the slicing sickness from 1 to 7 mm with a simple twist of a side knob. Meanwhile, two built-in julienne blades will let you make refreshing salads your way. 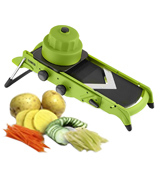 Whether you want fruit, vegetable or even cheese slices, cubes or sticks, this mandoline will deliver any type of cut to cook a variety of dishes, be it garnishes and soups or appetizers and desserts. Along with exceptional functionality, the Tower slicer stands out for a robust and compact design ensuring long service life, convenient use, and easy storage. Heavy-duty stainless steel blades will deliver consistent performance for many years to come while a durable base stand of durable ABS plastic can easily withstand extensive daily use. Non-slip feet provide stability on any surface and are foldable for space-wise tool storage. A handy food holder paired with a super safe blade system will save you the need to ever touch a blade. 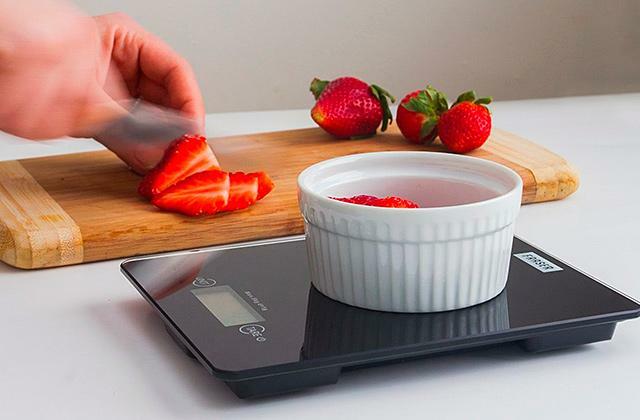 The safety guard keeps your fingers well away from the blades and three side knobs will let you engage julienne blades, select the cut size, and adjust the platform height to get the desired slicing thickness. 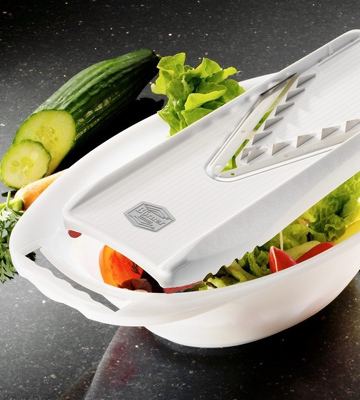 If you are into healthy eating or simply try to follow a balanced diet and your daily menu includes a variety of fresh fruit and vegetable salads and mixes, this simple yet practical mandoline from Tower will help you slash the time you spend on slicing, dicing, and chopping up to 50%. 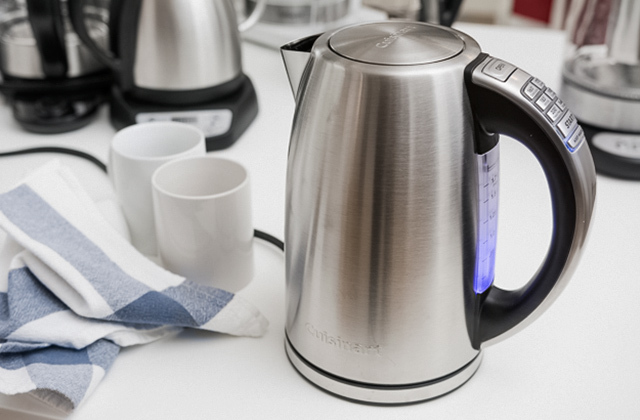 Without a doubt, it is hard to overestimate the use of household appliances in our modern life. Indeed, all those coffee makers, rice cookers, food steamers, microwave ovens, yoghurt makers, etc. improve our life and make it easier by saving our precious time and greatly facilitating routine chores. Today, it is already nothing special that by the time you get up in the morning, you can have your breakfast hot and fresh and ready for you had you set your appliance in advance. 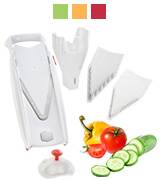 Likewise, a mandoline food slicer is one of the kitchen appliances that's designed to let you enjoy cooking more. 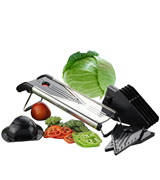 With this food slicer, you'll be able to cut, slice, julienne, dice, and even grate fruit, vegetables, cheese and more. Commonly, you can choose between two major mandoline types: a handheld tool and a kitchen mandoline with a stand. The first type is usually fitted over a bowl and should be held with one hand when you move a food item up and down over the cutting surface. The second type is usually adjustable and provides better stability and manoeuvrability. Besides, mandolines can feature several different types of blades including a straight blade for hard fruits and vegetables, a diagonal blade for softer ones such as tomatoes, peppers, peaches, apricots, etc. and a V-shaped blade for delicate foods. 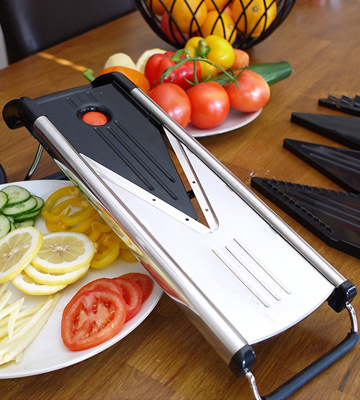 With a good mandoline slicer, you can create the whole variety of dishes be it bite-size canapes, salads, and garnishes or crispy snacks and multi-layered desserts. Finely cut fruit and veg slices, shreds, cubes, and ribbons will give a kind of appetizing appeal to your meals. 1. Mandoline, Wikipedia. December 22, 2017. 2. Amy Sherman Why Everyone Needs a Mandoline in Their Kitchen, Tasting Table. Apil 6, 2017. 3. 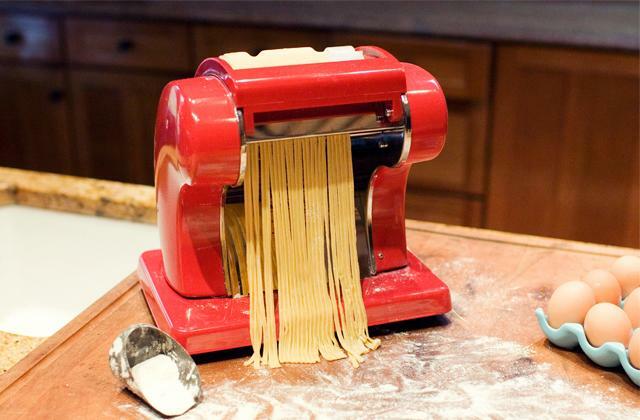 Dana Velden A Brief Guide to the Scariest (But Most Amazing) Tool in Your Kitchen, The Kitchn. January 5, 2016. 4. Julia Platt Leonard Why use a mandoline when we have knives? Independent. August 4, 2017. 5. Patrick Allan Four Tips for Mastering the Mandoline Slicer, Lifehacker. May 14, 2016.